Apparently as of the release of CS5, Adobe decided to add (or at least make us more aware of) a feature called InDesign Background Tasks. What’s this “InDesign Background Tasks” all about? Basically what the InDesign Background Tasks does, is it allows you to export a PDF file in the background while still being able to work on your InDesign file in the “foreground”. Pretty cool huh? “But why won’t my InDesign file export to PDF?” Well if you’re not using Adobe InDesign CS5 or a newer version, here’s a screenshot of what it looks like when you have a PDF exporting in the background. This new feature is a great addition for when you’re working on a small file, like a business card design or a 5 page brochure. However, I found that “trouble strikes” when you try to export large PDF documents. Like the 100+ page document that I was trying to export! What happens is, the progress bar keeps moving, but it just hangs there and doesn’t seem to do anything! I even waited for about half an hour one time! The InDesign background task won’t cancel! Ridiculous! This issue may not happen to everyone, but after doing some Google’ing, I found I wasn’t alone. I tried a couple of the solutions that I found which did the trick and disabled the background tasks. But I wanted the option of being able to turn it back on. So what was the best solution? Well I was in luck! Apparently the new InDesign Background Tasks feature had annoyed a few too many people. So one smart guy, Marijan Tompa, created a startup script which adds a menu item to the File menu in InDesign. 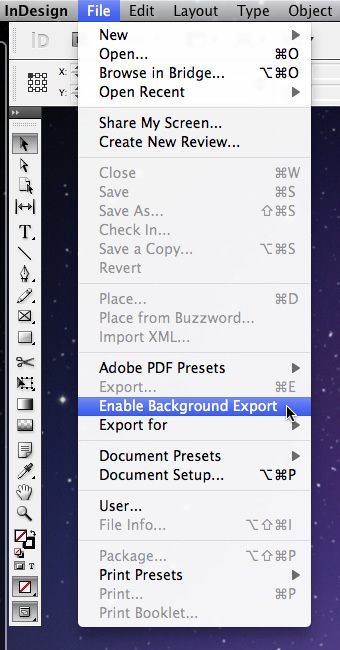 The menu item gives you the option switch InDesign Background Tasks on and off. For some auto-magical reason, that’s all that’s required to disabled the background exporting of any file in InDesign. Then when you toggle off the Background Export from the File menu, it removes the DisableAsyncExports.txt file which then enables the Background Tasks feature again. Really appreciate this extremely helpful tip. Couldn’t figure out how to stop the background task. The script works beautifully. Thanks again. It has been very helpful, bcoz while my client was waiting for last Booklet i was designing we waited like a half hour for a pdf render task to show up and i got ashamed, but after few minutes of googling the main problem, i found you guys really helpful. keep it up. good work done for sure. Thank you for sharing this Geoff. Can I ask please does this script work for CS6 as well? Thank you so very much for this explanation. I saw this workaround on several other forums and blogs, but you are the first to explain it in plain english (or at least basic enough for me to follow)! Thank you!! Wow Kim! What a debacle! Did you end up finding a solution to this? And are you on a Mac or PC? I tried and it won’t work on mine either. I see the option under the ‘file’ dropdown, but it’s not ‘clickable’… and upon export, get the same issue as before. Sorry to hear Will 🙁 Are you on a Mac or PC? And what version of InDesign are you using? Good stuff Steve! Hope you hadn’t pulled out too much hair before finding the script! Haha! 😛 So you’re using InDesign CS6 – are you on a PC or Mac? It seems as though a few people are experiencing different outcomes from the same script. That’s awesome mate! You’re welcome! Glad the script worked for you! 🙂 Just out of curiosity, are you on a Mac or PC? Hmmm, the script seems to be working for some people with CS6, like myself. I’m on a Mac and I’m using Adobe InDesign CS6 still and it works for me. What operating system are you using Sharon? Funny thing is, I can see under “File” where it says “Disable background export” but it does nothing. I am trying to save a 64 page magazine and I’ve given it at least 5 hours of waiting time and nothing, although the bar keeps going a little triangle yellow warning sign pops up next to it with a exclamation point in the middle of the yellow triangle sign. Bottom Line HELP! Thank you so much for this post and script! I never had this problem before with CS6.0 until yesterday. Worked perfectly. A big help so I can get my document off to the printer today. I doesnt work for me Geoff Im windows user and indesign cs6. PLease help me out. Sorry to hear Juan. There’s not a lot I can do I’m afraid. What version of Windows are you using? Are you getting an error message or something or it’s just not working after you’ve put the script into the according directory? I got the disable background output script to work in InDesign CC by saving it instead to Mac: /Applications/Adobe InDesign CS5.5/Scripts/Startup Scripts. I then exported the doc I was working on as .idml, opened it back up and found the script working as described under “File>disable background export”. Nicely done, Elizabeth! Interesting way to go about it, but hey, it worked for you, so thanks for sharing! 🙂 Hopefully this helps a few other people out there who use InDesign CC on a Mac and/or if they can’t get the script to work the way I’ve stated in the article. Just a note re: exporting as .idml. When I first opened the document.indd, InDesign CC hung then just as I was about to force quit it opened. That’s why I decided to .idml it. Just found this tutorial and really worked! Thank you for sharing! Hi Geoff, talking about background tasks: I’m working with an average of 180 cross references between several documents part of a book file. These are making the computer to go so slow that I literally could go to get a coffe between every command. I figured InDesign is constantly updating each cross reference. Are you aware by chance of how to disable this task? Hi, I wonder if you can help, I have CS6 and I have downloaded and put the control background export file in the relevant startup scripts folder, the disable background export is listed but doesn’t seem to change or do anything? Please can you help? Who or what are you referring to exactly Sune? The script does work, but apparently not for everyone unfortunately. Just wanted to say THANK YOU SO MUCH for posting this up. I’m using CS5 InDesign on a 21″ iMac and never had problems exporting to .pdf before. Read a lot of articles on how to sort the problem but yours is by far the clearest and simplest and worked perfectly for me. I see you originally posted this in 2011, well five years later it’s still helping people! Good karma. Thank you. Note for users of windows 10 and InDesign CC: It is necessary to change the write permissions of the folder C: / Program Files / Adobe / Adobe InDesign CS5, otherwise, the script can not create or delete the file DisableAsyncExports.txt. You’re welcome Carlos – and thank you for the Windows 10 tip! I’m a Mac user, so I wouldn’t have known this one! Are you still able to help!?? Suddenly none of my PDF’s will export. I am going crazy and biz stopped while trying to figure this out!!! Using Indesign Cloud Package so not sure if the script would work with that? Hi Kelly, so are you saying that you’ve installed the script and now your PDFs won’t export? I’m not sure if the issue is with the cloud package. In theory the script should just work so long as it’s in the relevant scripts directory. Thank you SO SO much for this! Saw this script on another forum, but you’re the first to actually explain it clearly! Thank you!